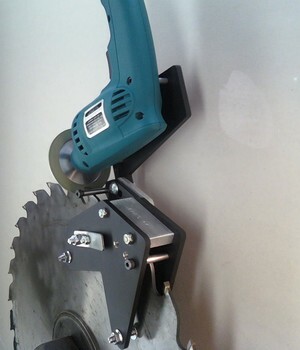 Headsaws, edgers, vertical edgers, multiple saws, chop saws, trim saws. Inserted tooth or carbide tipped. For sawmills with carbide saws, this versatile grinder sharpens edgers, scragg saws, vertical edgers & headsaws. Tensioned guide pin assures accurate grind every time. Press tension level for quick, easy movement to next tooth. Has adjustable thumbscrew to quickly set "lead in" and "lead out"
This is the best grinder for all types of carbide saws. Comes with 4" diamond wheel. Will not sharpen steel bits! Wear pins adjust for different styles or carbide tips saws.